I stopped in at Troy's shop after work and confirmed that he was still coming over this evening to help install the rear end. He said he was and I double checked to see if he needed me to buy anything or get anything ready. He said "Nope, just be there". This afternoon, after I stopped at Troy's, I decided to apply Threadlocker Blue to the bolts Sara and I had torqued on the rear sway bar end link brackets this weekend. 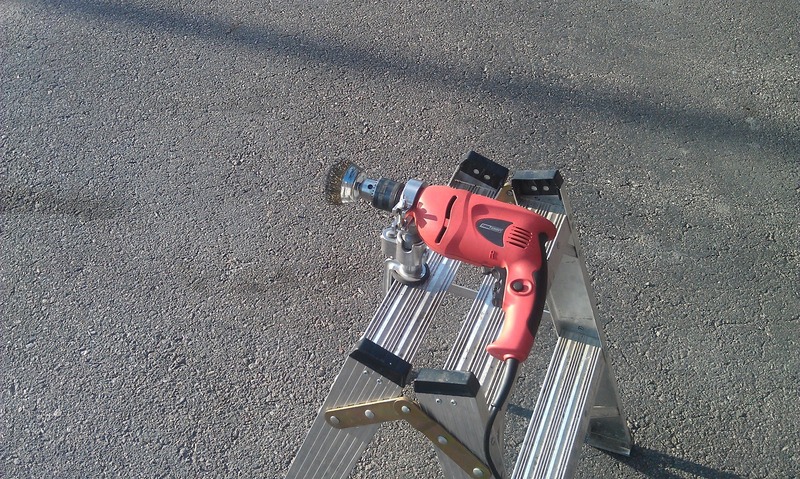 This involved removing the bolts one by one, cleaning them, applying the Threadlocker, and torquing them again. This afternoon Jonathan decided to go through some of the tubs in the garage and get out the parts we need to install the rear end. The first thing he found was the rear shocks. He decided to get them put into place so they are hanging and ready for installation. I told Jonathan we could work on KITT all day long today, and that is what we did. 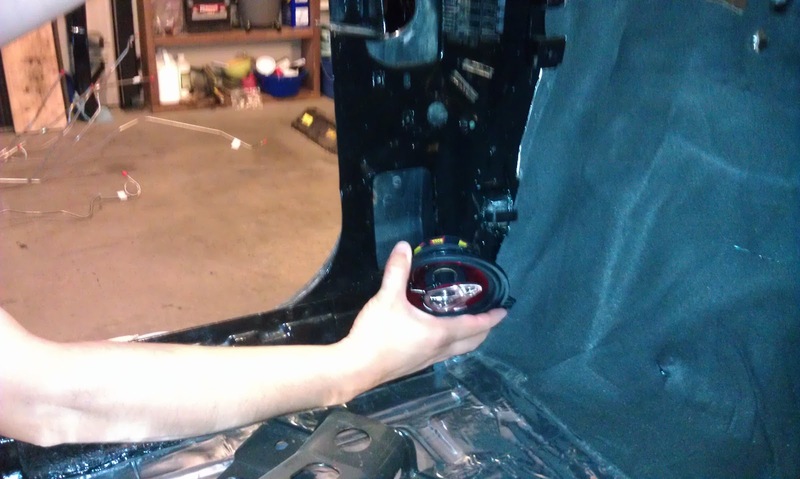 Jonathan started this morning by test-fitting his new speakers. These are the 5.25 speakers that will go in the kick panel area. This is where the models equipped with the Bose stereo system had speakers mounted. The speaker magnet fits easily into the opening already in this area. We should not have to modify much to get these speakers to fit perfectly. Troy called this morning singing birthday greetings, and to tell me Farm Power Manufacturing had called him and said the mounting plates were ready to be picked up. Sara and I had brunch and then drove out to Farm Power Manufacturing to pick them up. The plates look like they will work great. These will be welded to the bottom bracket portion of the muffler clamp. The total came to $23, which is what I had expected, but the guy at Farm Power Manufacturing was quite surprised it cost that much. He said he thought it would have only cost a few bucks for the two little plates... which made Sara and I wonder just for a second if we were being ripped off. ;) My total cost to make both clamps was $32, which is a far cry less than the aftermarket ones that are available online for $100+. So no matter what, I think I did pretty good. Here is the taillight blackout I have purchased for KITT. Watch for an upcoming blog post when it comes time to install it. Project: K.I.T.T. 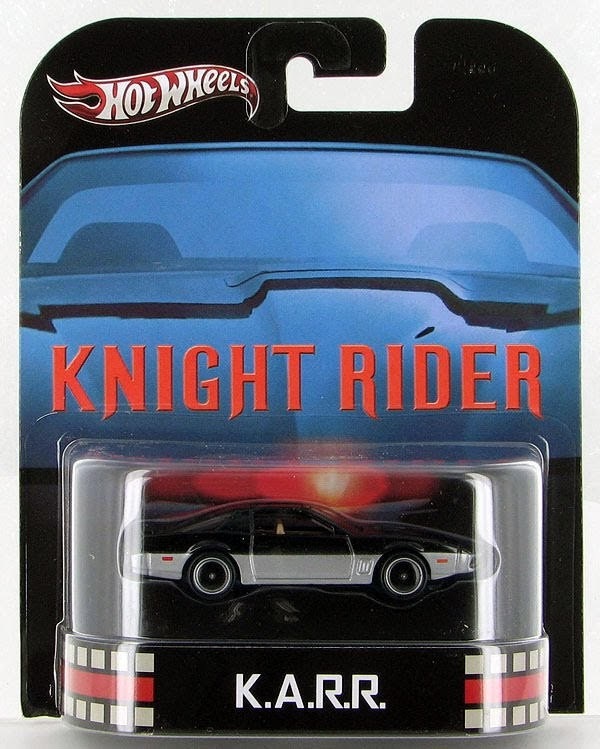 has chosen Knight Designs for all of the Knight Rider related conversion parts needed for KITT. Billy's parts are absolutely the best out there and I think this video sums up why. I am going to be posting a few of his videos on the Blog just to highlight some of the wonderful parts that will be going on KITT in the near future. If you have not already, be sure to visit his website at www.KnightDesigns.com. I had to go in to work early today and was off by 1:00PM, just in time to have lunch with Troy. We talked about some of the hardware I am going to need to replace, such as the rear sway bar mounts and the bolts for the A-arms. I had done a little looking online for the rear sway bar mounts only to find them extremely overpriced, at least in my opinion. 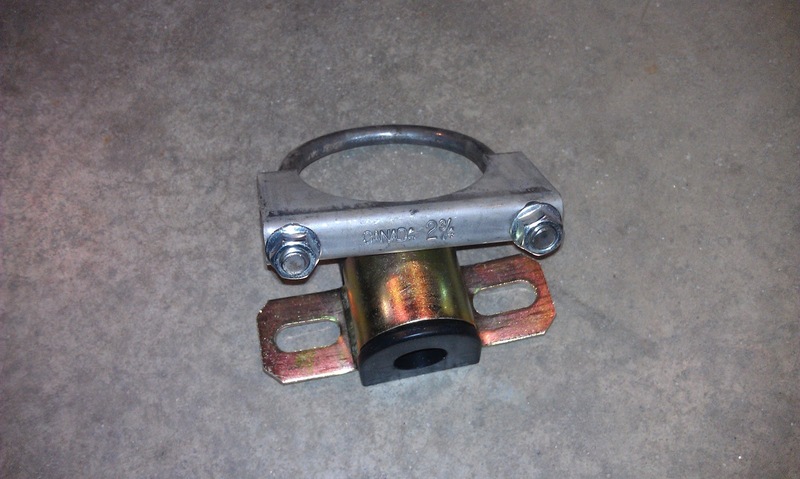 The stock ones were nothing more than a glorified U-bolt style muffler clamp with a mounting plate on the bottom. Troy made some calls and located a pair at Exhaust Pros that were the right size. I ran and picked them up and also grabbed my sway bar bushings so I could see what modifications we would need to make, if any. As you can see in the picture below the clamp is about half the width of the busing, which means we will need to fabricate a mounting plate for the bottom. I took both parts to Farm Power Manufacturing to have two plates made to those specifications. 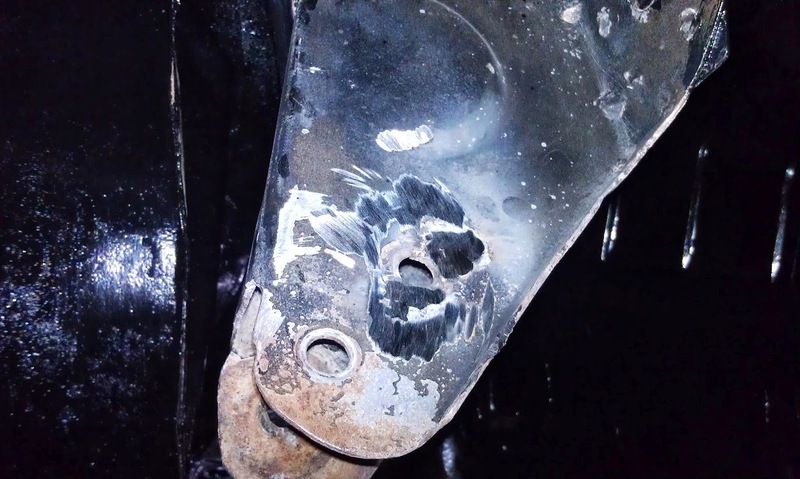 Once we have the plates we will weld them to the bottom half of the clamp and we will have made new sway bar mounts for far less than any of the aftermarket ones. Today I discovered that you can never have too many pictures. There have been many posts already where I have said, "I wish I would not have taken so many pictures; we really do not need all of them". Well, I am here to tell myself that yes, you probably do. I wanted to be prepared to reinstall KITT's rear end by making sure I had all the hardware ready to go. There are some things I just was not sure about, even though we marked and bagged everything. I figured the easiest way to figure it out would be to look for a reference picture from before we removed it. Guess what? I don't have a picture that shows the particular hardware I am looking for. Lucky for me I have the illustrated parts book for the car and could compare notes with that. So, just for the record, if anyone should attempt a project like this, make sure to go nuts with the camera. You cannot have too many pictures! 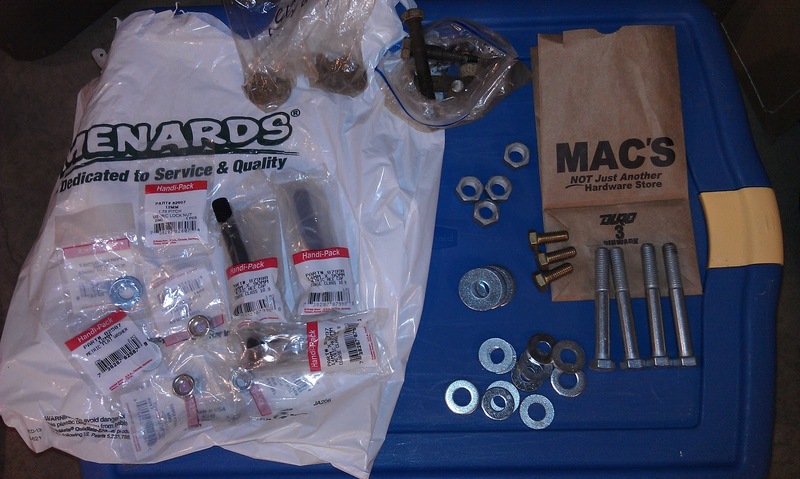 After finding most of the hardware I was looking for I decided to clean up the bolts a bit. I don't have a grinder with a wire wheel, but I do have a clamp for my drill that allows it to become a stationary wire wheel. I spent a little time this afternoon adding some more sound deadening to the transmission hump. There is a lot of noise in this area so I ended up doubling up a little. 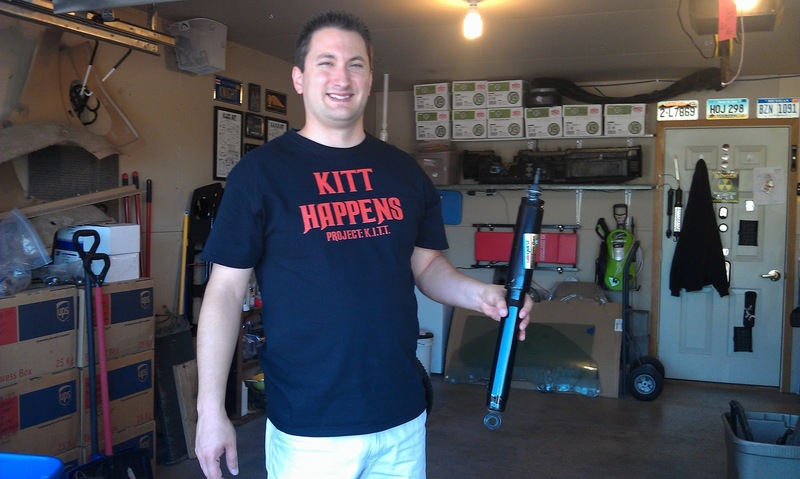 Troy was stopping over this afternoon to help reinstall KITT's rear end. In preparation I started getting everything we would need ready. This included the Panhard/track bar brace that I had treated with Prep and Ready yesterday. I had let this soak all night and it had completely gelled this morning. Sara and I sprayed it out with water and it did remarkably well at removing the rusted corrosion inside. Unfortunately it still had a ways to go before it would accept the original 14mm bolt. Troy called as I was pondering how to enlarge the metal sleeve in the brace. He wanted to let me know that he was running late due to a late appointment at the shop and he would be over as soon as he finished. I told him about the issue with the sleeve on the brace and he said to bring it down to the shop and he would use the die grinder on it. Sara and I took it down to the shop and Troy was able to use the die grinder to restore the sleeve to its original size. He said that he would be finished here and stop over in about 45 minutes. That was at 1:30PM. Before I left I borrowed a 9/16 drill bit to enlarge the holes in the Panhard/track bar bracket. The original bolts were stepped down from 14mm to 12mm and as a result one hole was 14mm and the other side was 12mm. I could not find replacement bolts in this style so I went with 14mm bolts. I needed to enlarge the 12mm holes to 14mm. I figured I could work on this while I waited for Troy. Friday after work Dad and I were on a mission to find replacement hardware for the Panhard/track bar, the Panhard/track bar brace, and the trailing arms/lower control arms. It took a bit of searching and a lot of running around, but we managed to find everything we needed. Thanks for your help Dad! Here is everything we bought. I needed to get the Panhard/track bar bracket painted today so it had time to dry before Saturday. That means I needed to get started in the garage right after work, even though it is the hottest day so far this year with a heat index that hit 105 degrees. Yuck! It's a good thing POR-15 is almost the exact opposite of paint and is okay in higher temperatures and humidity. 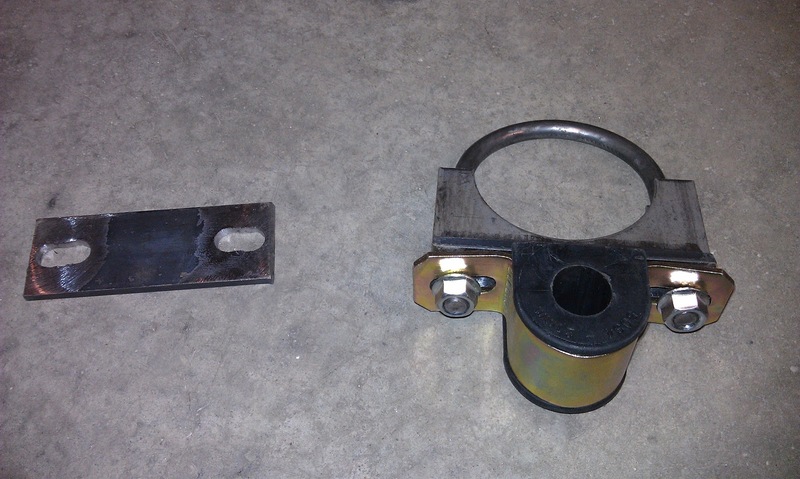 Here are some before shots of the Panhard/track bar bracket. 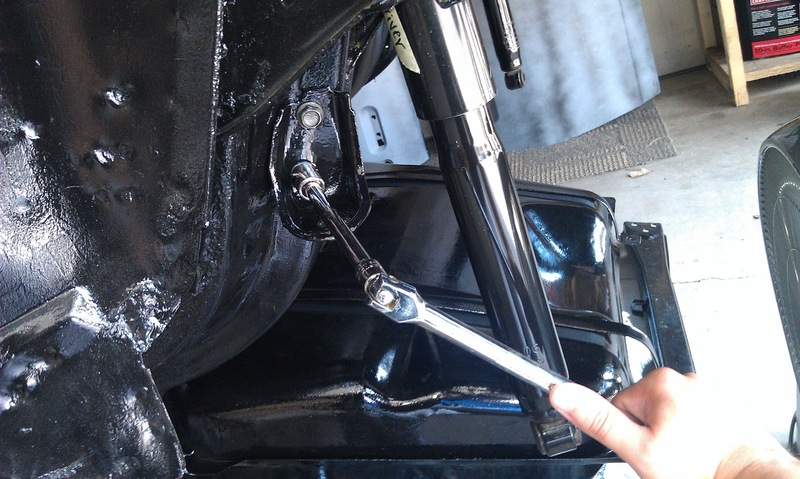 Troy made it over Wednesday to weld the Panhard/track bar bracket and subframe connectors! 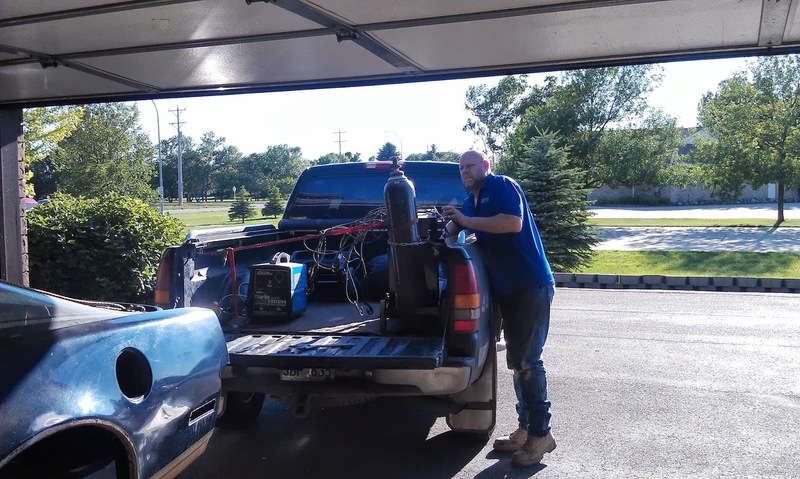 Here he is unloading and setting up his welder. 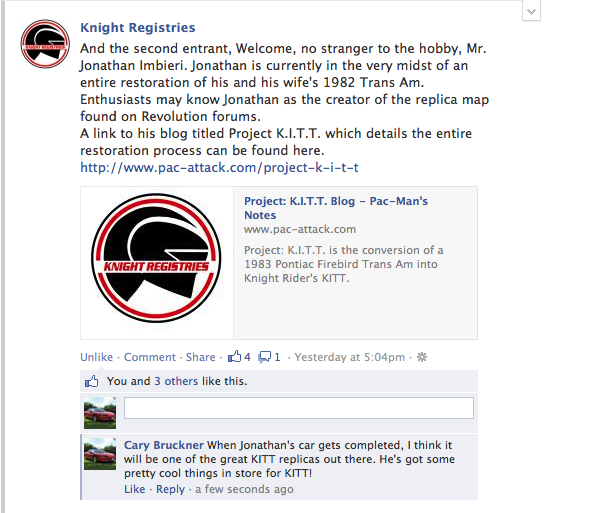 I have been conversing with Kevin Knight of Knight Registries as he works to restore the Registries to their former glory, and through our discussions I entered KITT for eventual inclusion. 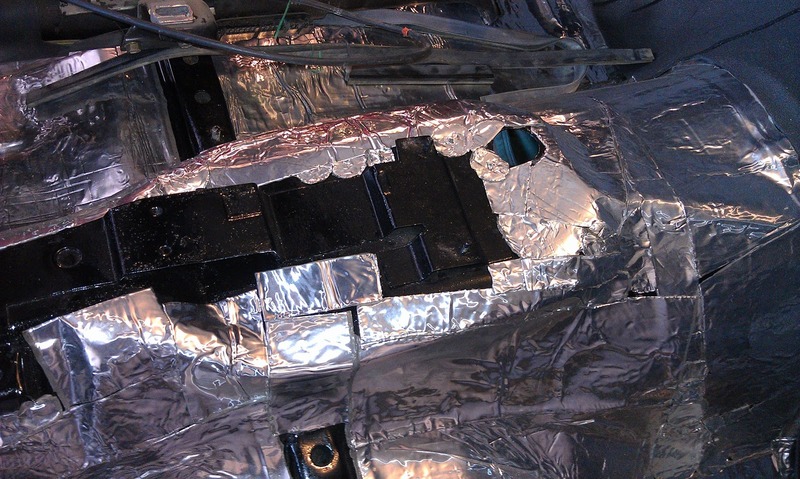 Sunday and Monday afternoon I spent some time working on sound deadening KITT's roof. I know there is a lot of debate among third gen enthusiasts as to whether this is worth it on a t-top car. I recorded a before and after video to answer just that (as much for myself as for everyone else). 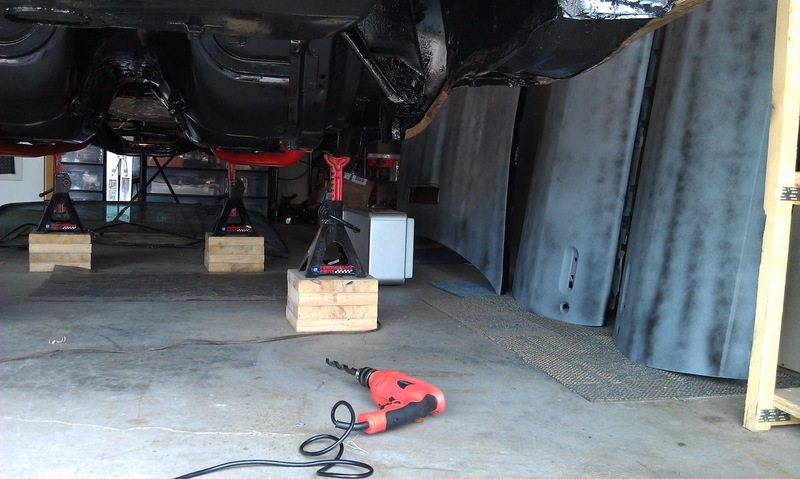 On two separate occasions when I spoke at length with Rick from RAAMaudio he stressed that covering or sealing up all the access holes in the framework of the car will go a long way to cut down the resonance. I took this to heart and along with covering a little more than 80% of the actual roof top (area behind t-tops), I sealed and/or covered every access hole I could find. Today KITT turns 1 1/2 years old. This is also the 250th post of Project: K.I.T.T.! I thought it was fitting to celebrate both occurrences by introducing The Blog Archive. The Blog Archive will allow you to view all posts by month and year, making it easier to read the blog in chronological order. For those of you that receive my email updates, you may have noticed some old posts sent to your email. During the process of creating The Blog Archive I noticed a few typos and corrected them. This shows up as an update in your email. Just think of it as a bit of nostalgic fun. 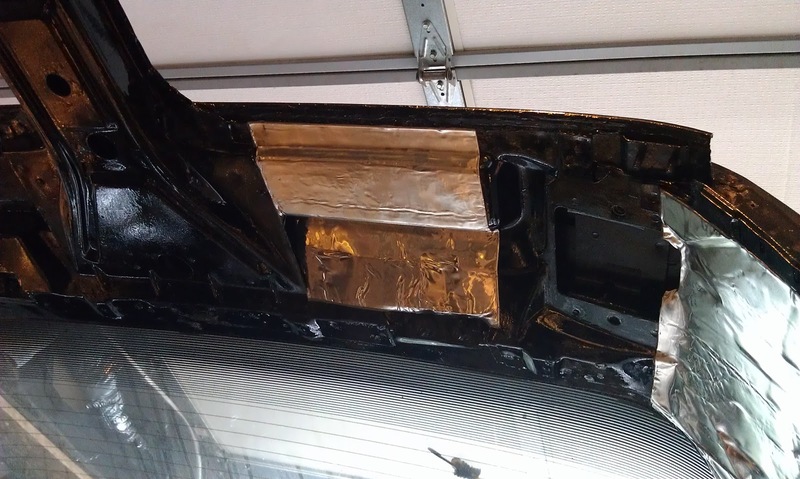 I spent some time yesterday and today working on more sound deadening. My focus was on the trunk area and the outer skins of the doors. I started with the trunk knowing that I would be able to use up a lot of the scrap pieces I had leftover from our work so far. 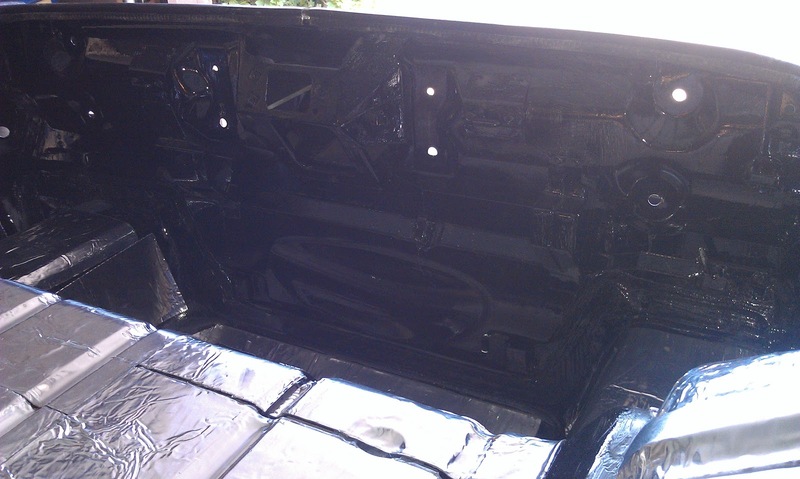 I was aiming for about 80% coverage of the rear trunk panel. 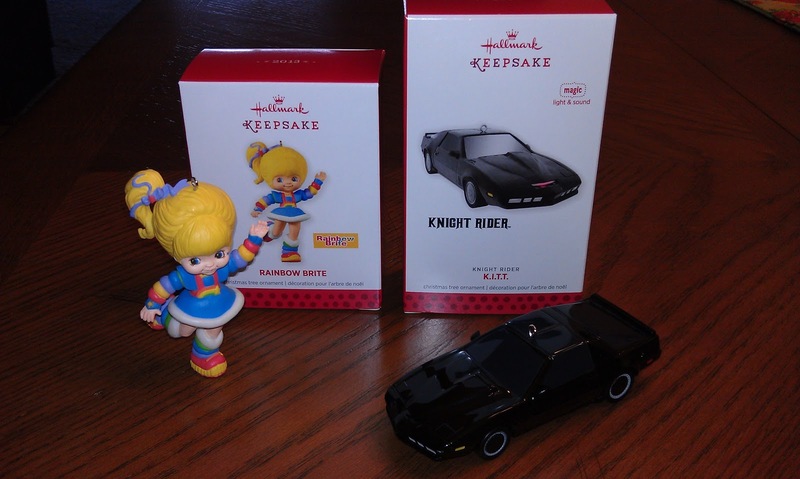 Today was the premiere for the Hallmark Keepsake ornaments and this year they are featuring K.I.T.T. from Knight Rider! Of course I had to pick up a couple. Here is my video overview of the K.I.T.T. ornament for 2013.